You know what I would do if I had a nice pristine corner of a yard that had nothing in it but grass? Let’s say you might do this if you had a corner that you would look straight into from your kitchen window, but that would also be nicely visible from at least one road. And let’s say, while we’re setting it up, that your yard also has just enough of a slope that you could put in a six-to-twelve-inch terrace about twenty feet or so from the edge of your property. First, I would pace off the distances and put in the terrace and fill in behind it with a nice, light soil mix that would drain well. 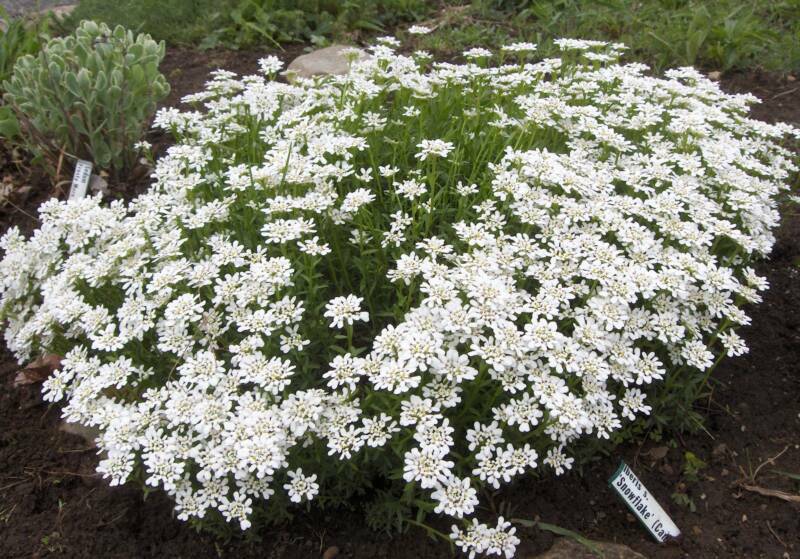 Then I would plant three or so old-fashioned Vanhoutte spirea along one edge of the corner, remembering that Vanhoutte spirea get huge (say, twelve feet wide). 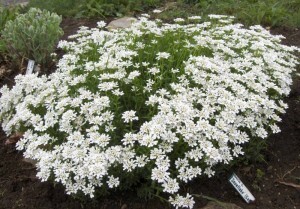 Or you could plant three ‘Shastas’ and one spirea instead, whatever you like. 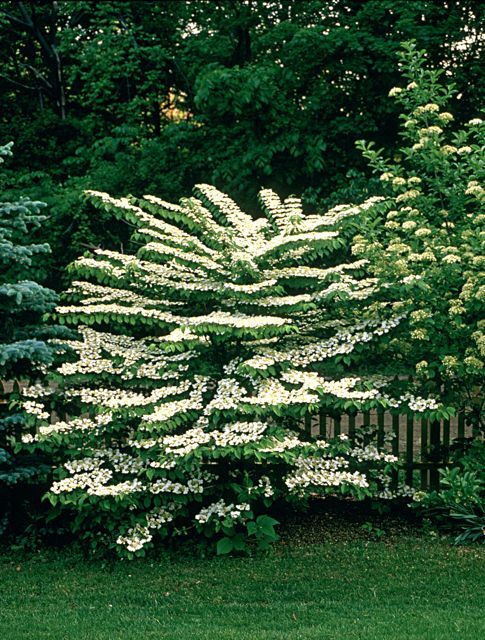 The viburnum is a great shrub, but it’s not going to bloom as quick as the spirea, by the way. 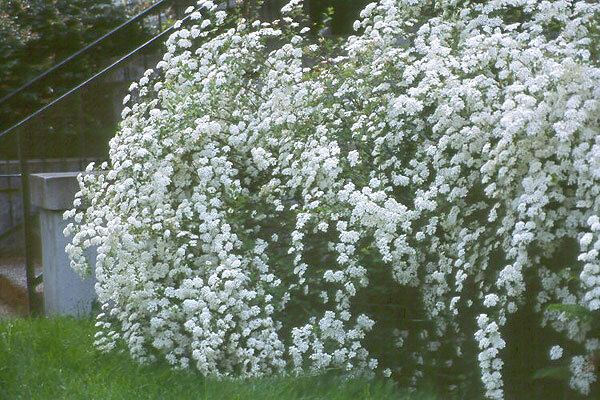 The spirea is easy from cuttings and will bloom in one or two years; the viburnum is actually also pretty easy from cuttings, but it takes five or six years to bloom so you may want to buy some that are already a decent size. And if there was lots of room, you might add a rugosa rose such as Rosaraie de l’Hay, which by the way has a very strong clove fragrance. 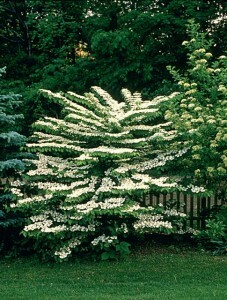 Then I would come forward about fifteen feet and plant one ordinary white-flowering dogwood. Not a pink, probably, though that would work, I suppose. 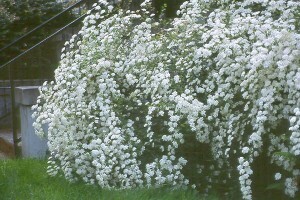 Having admired my dogwood-spirea combo this weekend . . . no, stick to white. Pink dogwoods aren’t a clear pink, but a pink with some blue in it, but the other pinks I’m suggesting here are also on the blue side, so they shouldn’t clash. But even so, stick with white: that’s my official advice for how to stop traffic. Don’t use a Kousa dogwood, though those are wonderful, because that would bloom too late most years to match everything else. 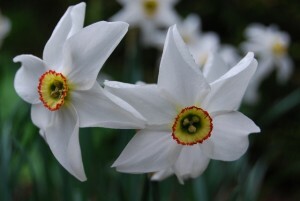 which is a very late flowering, small-cupped, fragrant narcissus that naturalizes well. And I’d add about five clumps of any decent late-flowering pink tulip, and I’d also add hostas if the area got afternoon shade or daylilies if it was a full-sun area, because I want something to hide the bulb foliage later. 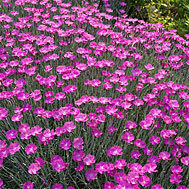 Keeping in mind that Dianthus SERIOUSLY hates wet feet, so don’t put it in unless you have a terrace! Six inches of height is plenty! And then, in a year like this year, where cool weather has kept the dogwoods going longer than usual, everything would overlap in bloom and it WOULD KNOCK YOUR SOCKS OFF. 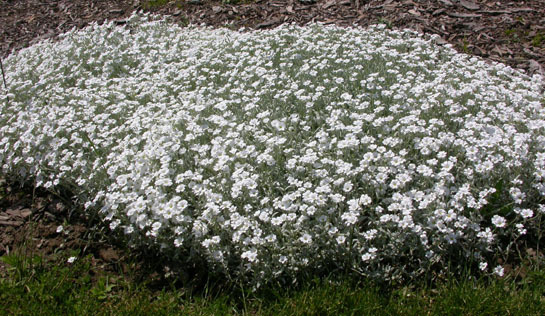 In any spring, lots of these plants would overlap, just not necessarily everything all at once. I have all these beauties, but alas, not all gathered together in one spot. Still beautiful! But the traffic, what there is of it past my house, only slows down rather than skidding to a halt. Hey I was searching for nice images of Narcissus Actaea* & happened on your blog. You can follow me on twitter @patiswhereitsat. Send me your twitter handle and I’ll do the same. *Going to plant those beauties today! Like your ideas: all good choices!